Multichannel recording for rental and production companies, churches and worship teams, concert halls, theatrical performances, touring units, outdoor and indoor music venues, TV studios, mobile production units, broadcast TV trucks, sporting arenas, or any live event. RADAR systems purpose-designed to run audio, and are rock-solid. You won’t have to make excuses for your RADAR. Go boldly without techno-tweaking and re-booting, with no concerns about OS issues or business software applications interrupting your audio. Turn it on. Arm your tracks. Hit RECORD. It couldn’t be more simple. Rugged Rack Mount designs also make for easy installation or for recording on the go. RADAR made its name as the best digital audio recorder, but now it’s proving to be the best DAW host too. Quickly switch from RADAR recording mode to workstation mode – running Pro Tools or your favorite DAW natively you can edit, mix, and automate, using all the plug-ins and features your workflow requires. We’d be lying if we said sound quality wasn’t RADAR’s best feature. Built with world-class converters and Adrenaline DR technology, RADAR transcends the digital barriers of sonic quality. The Recording Engine houses iZ’s proprietary and time tested Trinity Chip with its frequency synthesized digital PLL to provide an near-zero jitter clock and super low latency audio routing, at all sample rates up to 192 kHz. 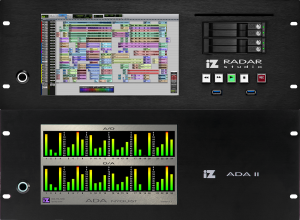 Just to make life even easier, RADAR integrates seamlessly into your existing audio system, with audio interfaces available for Dante, MADI, AES audio, or analog audio inputs. Systems start at 24 channels and expand upward from there.